Films like A United Kingdom are incredibly tricky to nail perfectly. At their core, they lie firmly in the kind of romantic-drama genre that invites scene after scene of soppy reunion or declaration of undying love. Yet, they tackle big themes and take on powerful true stories, meaning that they must find a way of portraying this story adequately while still pleasing fans who come for the genre rather than the narrative. It's a balance that, when struck seamlessly, has the ability to create something truly memorable, but just a few minor slip ups in the wrong places can cause any film of this nature to come crashing down. In its earlier moments, and in a variety of other particularly notable sequences across the film, A United Kingdom strikes the balance with a deft precision that had me feeling like this could wind up as one of the year's very best, but as things progress the script starts to lose its grip on this tightrope and a frustratingly high number of minor quibbles bubble to the surface and just force the film away of greatness. That said, the film's depiction of this powerful story is admirable. 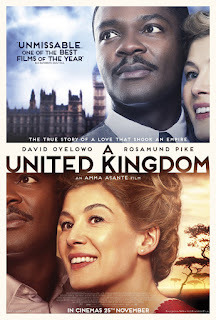 Seretse Khama (David Oyelowo) meets and falls in love with Ruth Williams (Rosamund Pike), and the two immediately feel destined for each other. Things get tricky, though, when Seretse reveals that he is the Prince of Bechuanaland, and their contrasting skin colours begin to cause outrage within Ruth's family and hometown. Seretse returns to his people in his homeland, bringing Ruth with him, but more trouble awaits them there as their highly forbidden marriage makes a bad impression on the Bechuanaland natives. It's a story that immediately packs a powerful punch, particularly due to the ways it still resonates in today's world. The film's script, penned by Guy Hibbert, certainly doesn't shy away from the harsh realities that both Seretse and Ruth face from those around them, but he finds strength in the story's politics rather than its romance. For those who want little more than a tale of true forbidden love, A United Kingdom works just fine, but those prepared for a more gritty and politically driven story that works to question the way we act and think will come away with a far richer experience. Hibbert's decision to focus the film on the politics rather than the romance pays off by the bucket load. The story moves along swiftly at the beginning (Seretse and Ruth meet within minutes, and are married by the 15 minute mark), and the screenplay does a solid job of buying us into their romance in such a short space of time. This quick opening act is needed, though, as the film has a large amount of story to cover and not a lot of time to do it. Perhaps this is why A United Kingdom does fall victim to a number of issues as it progresses: supporting performances vary in quality (Jack Davenport is terrific, Tom Felton is awkwardly miscast); the repeated use of translucent newspapers appearing on the screen don't quite match the tone of the film; there are a frustratingly high number of awkward and unnatural cuts to end sequences that don't quite feel finished yet; the soundtrack begins to grate, feeling too on the nose during any of the more emotional sequences; the black and white freeze frame that ends the film is dangerously close to tipping the whole thing off balance. None of these are enough to ruin the film, but it's tough to fully invest yourself in a story that seems content to drop little glitches like this every ten minutes or so. While they're tough to ignore when you look back on the film overall, most of these issues don't frustrate for too long as something great is usually hiding just around the corner. Amma Asante's direction here is terrific. She finds a number of nice moments that are captured with the kind of visual poetry that most films of this genre tend to forget, it just adds some warmth to the story even in its darkest moments. She also perfectly understands the scale of everything that takes place, ensuring that she never overplays nor underplays any particular moment. None of this would work, though, without her cast. Oyelowo is fantastic, capturing the stakes that Seretse feels burdened with but keeping his love for his wife brimming at the edges at all times. He feels powerful and dedicated and forceful, but also delicate and controlled. Pike steals the show, however, with her seriously impressive turn as Seretse's wife. The film asks a lot of her, but she succeeds in striking a perfect balance between lonely wife and empowering woman. We feel the suffering she endures, but we never feel like she isn't capable enough to get through it all. Pike has a way of playing the quieter types with a real conviction, as if there is always more to them than we're allowed to see, and she brings that to the table here masterfully. I wouldn't be surprised to see another Oscar nomination come her way this year. It's frustrating, then, that the film's uneven script is what lets it down. The film frequently dips into a kind of corny and forced tone that doesn't sit right with the characters, and watching actors as talented as Oyelowo and Pike deliver lines like this is uncomfortable. The film is enjoyable enough, but it works best in its quietest, softest moments. Ruth puts her troubles aside for a day, and assists the locals with their daily routines. They reward her by gathering outside her home and collectively singing a song they have written for her. Later on, Ruth is briefly reunited with her family, and some smart cinematography leads to a small reveal that is easily powerful enough to evoke a tear or two. In both of these sequences there is hardly any spoken dialogue, and they are by far the most touching moments of the film. When the script is sidelined and Asante, Oyelowo and Pike are free to work their magic through visual artistry and performance alone, A United Kingdom feels truly special. There are too many little niggles floating around for the film to reach the year's top tier, but it works as a pleasantly enjoyable diversion with something real to say about the world we live in. It's nice, it's thoughtful and it's powerful, and all of the big stuff lands. To Summarise: Despite its frequently uneven script, A United Kingdom runs solidly thanks to its smart direction, powerful true story and the dedicated performances of its two leads.